Need to leverage Calculus AB or Calculus BC? Enroll in ourcollege application boot camp to get the counseling and advising you need. 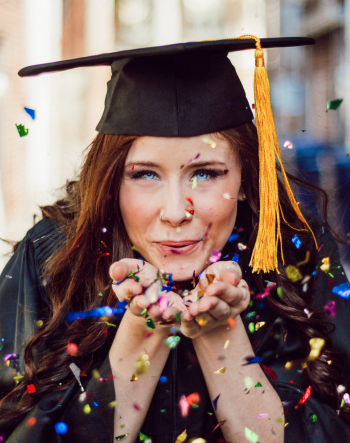 These are questions that many students and parents have when preparing their high school and college schedules, so you’re not alone. Figuring out the answer requires you to learn what both courses offer, their exam set-ups, and weigh this information against your credit requirements, and academic/personal goals. We’ll start by looking at a general overview of calculus and then the Calculus AB and Calculus BC options individually. It’s not until a person is faced with the task of choosing between math courses does one actually consider what these courses of made of. Both Isaac Newton and Gottfried Wilhelm Leibniz independently discovered the concepts that make up calculus in the 1600s. People have been using it to create mathematical models ever since. The discipline grew out of the desire to understand natural phenomena, such as orbiting planets and gravity, in a deeper way. This explains why so many science-based fields require an understanding of calculus. Economists use it when deciding on the right time to buy and sell goods. Google uses it in its search engine algorithms. The field of engineering, in particular, requires its specialists to understand the mathematical study of change. Many engineers use calculus in their everyday designs, using it to decide on the size and shapes of curves when building structures. Although it’s a dreaded subject by some, calculus is very useful as it can help you solve problems in many other fields including engineering, physics, economics, biology, and medicine. Who knows? Maybe this can be one of the easier courses you take! Pre-calculus is usually a requirement, especially at the college level. Limits, definite integrals, derivatives, as well as the Fundamental Theorem of Calculus. Which leads us to an important point: there are two different types of calculus: differential calculus and integral calculus. Calculus BC is a review and continuance of Calculus AB. 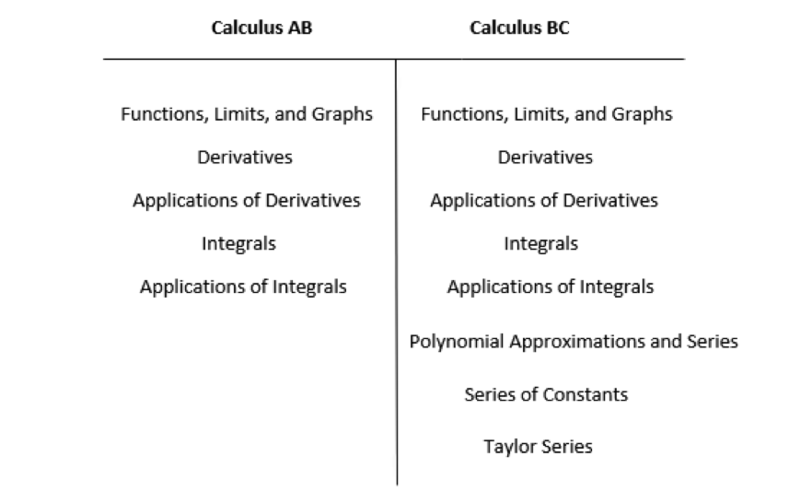 BC can be viewed as an offshoot of Calculus AB since all of the topics in Calculus AB (single-variable calculus) are also included in Calculus BC, plus some. Unlike courses like Algebra I and Algebra II, Calculus AB (Advanced Placement Calculus) and Calculus BC do not have to be taken in a specific sequence. Meaning, you could take Calculus BC without having ever taken Calculus AB. Many students do. A common myth is that Calculus BC is a lot harder than Calculus AB. This is not always the case. These two calculus courses are different in scope, but not necessarily in complexity. Calculus BC is only considered a more difficult course by some because it covers more material. Pre-calculus is a prerequisite for both types of calculus. All of the topics covered in Calculus AB are also found in BC. Calculus BC goes further than AB, touching on additional mathematical concepts. Because it includes more concepts, Calculus BC is a more fast-paced course than AB. Although the sequence of the topics can vary by school and course, the T-chart below provides a general comparison of the two different tracks. As you can see, Calculus BC is not a different course from Calculus AB; it is a more in-depth version! Calculus AB is usually split up into three sections: functions/derivatives/integrals. When deciding on which type of calculus to take, it can be beneficial to take a more in-depth look at what is included on the exam for each course. This will allow you to decide if you’re ready to take on either course of study or maybe even both. Many of the same topics found on a Calculus AB exam will also appear on a test assessing the understanding of Calculus AB. However, more advanced techniques will be required, and other topics will be added including series, sequences, and polar functions. When it comes to AP exams for college credit, The College Board schedules both the Calculus AB exam and the Calculus BC exam at the exact same time. This makes it impossible for a student to take both tests in the same academic year. The exam structures are identical, as is the amount of time you get on the test. The main difference is what is included. This isn’t to say that the BC test is harder. In fact, many students find Calculus BC’s exam to be less challenging because of the way the material is distributed. Because there are more topics to cover, the questions are not heavily focused on any one particular area. This allows for more ‘breathing room’ if you struggle with a particular concept. Now that you understand the difference between the two courses, you may be trying to figure out which to take. Although you will get more college credit for taking Calculus BC, it is not always the right option. If you do not need Calculus II for your major, then you might be better off taking Calculus AB only. The same can be said for students who struggle with math and think that a fast-paced course like Calculus BC will be too challenging for them. You’ll be free to take another course if your college is one that uses block scheduling for Calculus BC. Your GPA can be boosted a bit by taking a less-challenging form of the same topic. If you’re a good math student, like a challenge, and know that you will need both Calculus I and II for your major, skipping Calculus AB and taking BC might be your best bet. BC provides for strengthening of skills that will be needed for math-heavy majors like engineering. It’s possible to get credit for Calculus I and Calculus II through this one course if you pass the appropriate exam, saving you both time and money. Calculus BC is viewed as a more challenging course, making it a ‘better look’ on your transcript. Most colleges will not give you credit for both Calculus AB and Calculus BC, so taking both courses would be pointless. However, some unique circumstances would make this a smart choice. If you’re at a school that requires you to take AB as a prerequisite to BC, then this will be your option. If you can get credit for both and want to build a stronger math foundation, you might consider taking both. The same can be said for students who took Calculus AB but struggled. Taking Calculus BC can be a ‘refresher course’ in a sense. Just remember that Calculus BC is a year-long course of study, so you wouldn’t want to try and take both of these courses at the same time. Which Should I Choose, AB or BC? Now you’re at the crossroads where you must decide which course to choose. If you’re still reading, then you might not have the answer just yet. If so, ask yourself the following questions. When taking Calculus AB, you will be learning about limits, definite integrals, derivatives, as well as the Fundamental Theorem of Calculus. Calculus BC will take your learning further, throwing in more advanced concepts. 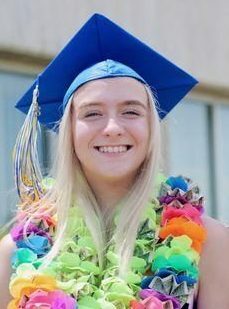 If calculus is a required part of your course of study, it is important that you make the right choice when choosing which path to take (Calculus AB vs. Calculus BC). Your answers to the questions above can serve as a guide.